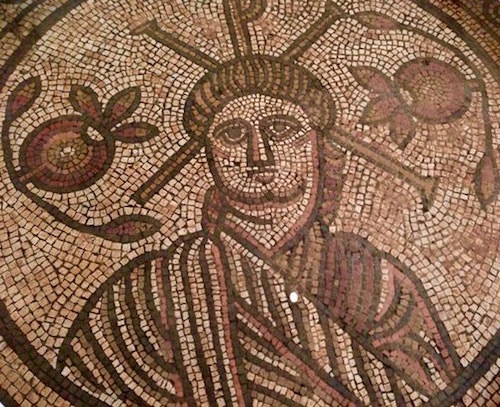 The oldest known mosaic in England depicting Christ and dating to the 300’s AD was found in 1963 when a post-hole was being dug by village blacksmith Walter White in the field behind his forge. The mosaic is mostly made from local yellow, brown, dark grey, and white stones and pieces of red tile, all set in mortar. 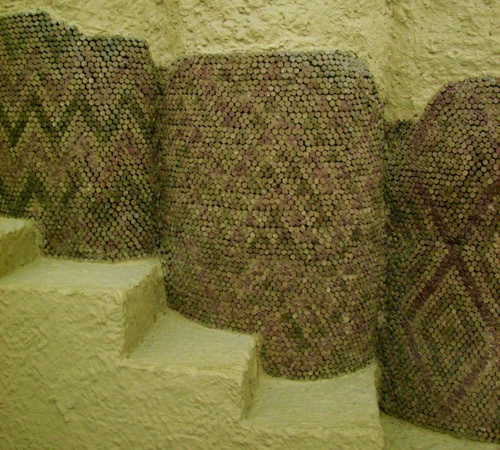 Creating art and patterns with the mosaic technique has been around since very ancient times. 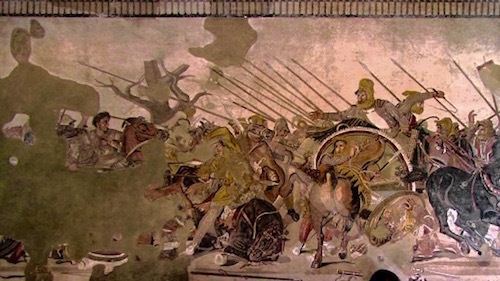 It seems to have been the Greeks in the 400’s BC and beyond who refined mosaic art to include people, animals and events imitating paintings rather than designs. By 200 BC tesserae, the small (often less than an inch) pieces used in mosaics were being manufactured and could be bought by artists. These pieces gave color and texture and shading to the mosaics. 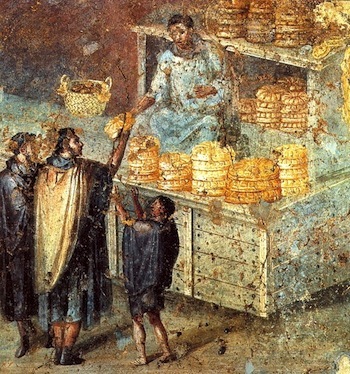 As the mosaic technique in the ancient world evolved, smaller and smaller pieces of tesserae were used in the mosaics. It is hard to imagine how long it would take an artist to make a very large mosaic using many .07 inch pieces! But they did and created incredibly sophisticated and beautiful floor and wall mosaics. The best of these, simulating a painting, were called opus vericulatum, “worm-like work” or “working worm-like” (tiny inch by tiny inch). 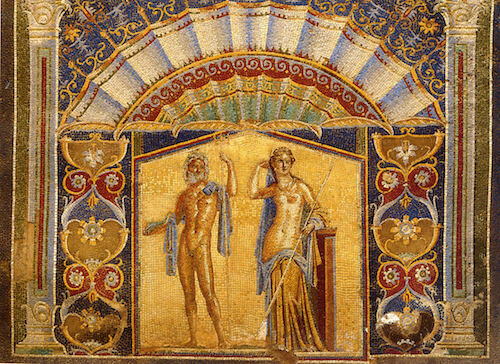 Sosus of Pergamon (c. 150-100 BC) is one of the few ancient mosaic artists ever named. He was from Pergamon, modern-day Bergama, in ancient Turkey. We know his two famous mosaics: The Unswept Floor and Doves Drinking From A Bowl. As in today’s world, there were then popular patterns to put on walls and floors. 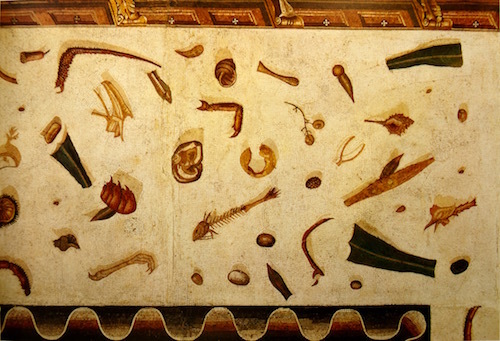 One may wonder why one would ever choose this mosaic of a floor littered with debris, but the ancient Romans and probably Greeks had many copies of Sosus’ The Unswept Floor (below) done in mosaic on their dining room floors. It, also, shows how messy their floors were after a fine meal! 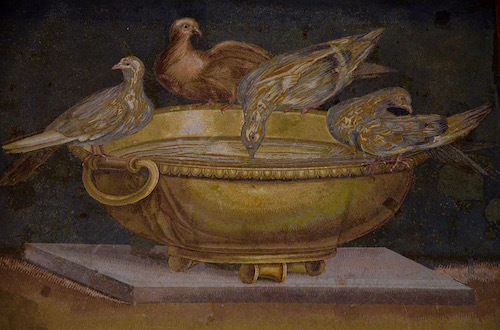 Mosaic showing “Doves Drinking From A Bowl” (bird bath), from Emperor Hadrian’s Villa, 2nd century AD. 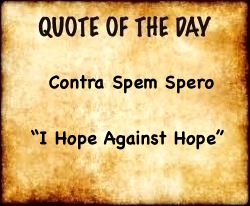 Probably a copy of Sosus’s work.